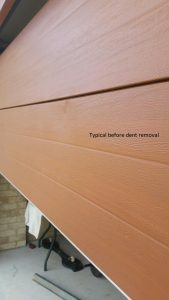 At Garage Door Restore, we often get asked the question ” Can you remove dents from a garage door in Perth? ” Unfortunately the answer isn’t a simple yes or no so i will try to explain a little. Most garage doors are manufactured from 0.6mm Colorbond steel. When a garage door in Perth is impacted by a vehicle , the impact actually stretches the steel slightly. This means that in places it might only be 0.4mm post impact. When an attempt is made to remove the dent, because the surface area of the dented section is actually slightly larger now due to the stretching effect, the dent gets pushed from one side to the other without being eliminated. In fact if the Technician (or tenant/homeowner) isn’t experienced in this process they can actually make the dent look worse. What we can usually do is make the dent look better. How much better? Well it depends. These factors influence how much we can improve the dent with a fair amount of variation. Typical results range from roughly a 40% improvement to 90% . In rare cases the dent will become undetectable. Our aim is to get the best improvement and results possible . They are considered good if the dent can no longer be noticed without it being specifically pointed out to you from less than 2M from the door, and not visible from 5M. We can’t offer any guarantees with this process because of the variable factors. However, after years of experience we can offer the best results possible. If the door has become bowed or buckled from the impact, there are usually a few things we can do to straighten it out as best as possible. Just like replacing wind struts, which help straighten the door. Once again, an outcome is considered good if the bow or buckle no longer stands out. If there are replacement panels available for that brand – Most often, replacement panels must be sourced from the original manufacturer as different brand panels don’t interlock in the same way, have different, textures and the patterns are spaced differently. The cost of replacement panels – Some manufacturers charge so much for replacement panels, that if one or more are dented, it may be more economically viable to replace the panel set. 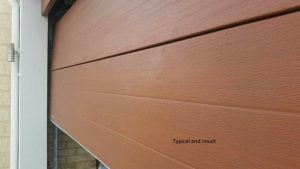 If your door is a Centurion or Steel Line/Perth Windsor garage door it can still be viable to replace individual panels as these manufacturers replacement panels are more affordable than others. Because it is rarely possible to remove a dent, buckle or bow 100% this can lead to conflict between tenants of rented properties and landlords. Especially if individual replacement panels aren’t available or are highly priced. From the tenants point of view they may view the situation something like “I made a small dent on one panel and they expect me to pay for a whole new garage door” and the landlords point of view may be ” the garage door was perfect and now it is damaged, the cost to get the door back to perfect condition should be paid by the tenant” . Our position is to not get involved in disputes. What we can provide is the best technical solutions at the best prices, with the best customer service standards in the industry. If you have dented your garage door in Perth, we offer free onsite quotes. Advise can also be given on the best remedy dependant on your situation and expectations. We also have close relationships with all major garage door manufacturers in Perth so if you do require replacement panels or parts we can offer the best prices. We can also give free estimates via email if you prefer.